We should have 100 in stock. Need more? It usually takes us 2 - 4 weeks to bring more in. 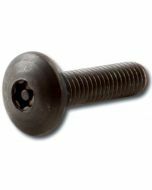 Standard 3/4" long rack screws with 10-32 threads feature self-guiding pilot points. HP screws provide a clean, modern appearance. Includes factory-installed nylon washer. 0.3" x 0.42" x 0.85"